Microsoft Graph is the unified endpoint to programmatically access resources and services in Office 365 and Azure Active Directory. To inform the developer community with the latest news, the Microsoft Graph team organizes a monthly Microsoft Graph API community call. We, Toni and I, were happy to contribute a use case at the last call showing a scenario of an Office 365 Group orchestration workflow with PowerApps, SharePoint Lists, Azure Functions and Microsoft Graph. In the February call, we learned about the newly released Intune APIs available via Microsoft Graph, we showed the groups provisioning use case with multiple Microsoft technologies and we saw options for storing custom data in the Microsoft Graph API. You can watch the recorded session on the dev.office.com/blog at Microsoft Graph Community Call: February 6, 2018. 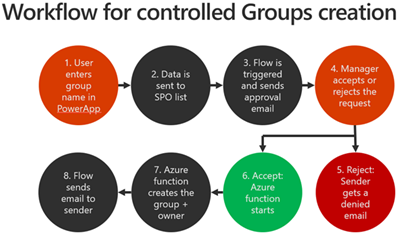 Our scenario showed an implementation of provisioning an Office 365 group with PowerApps, SPO, Flow, Outlook and an Azure function, see the recording for the flow. Thanks for inviting us to be part of the Graph community call, we hope our short contribution was useful! The Microsoft Graph community call occurs every first Tuesday of a month. The first calls were on 5th Dec 2017, 2nd January and 6th February 2018. So, the next call takes place on 6th March. Open aka.ms/microsoftgraphcall to add the recurring monthly calendar invite to your personal calendar. You can follow the latest calls and information at dev.office.com/blogs. We can highly recommend to join the Graph calls, since you get the latest news on Microsoft Graph as key technology to data and actions available in your Office 365 tenant. In the calls, you can reach out to the product team directly with questions. The Graph team is very ambitious about delivering new features on a monthly basis, see the Graph changelog. For reporting Microsoft Graph issues and technical questions, use stackoverflow.com. Another recommended and useful option to give feedback and ask for features is at officespdev.uservoice.com - the Office Developer Platform UserVoice page. For us at atwork, using the Microsoft Graph is a key factor for many of our solutions, as Delegate365 and our Tools for Office 365 as they take advantage of that technology. So, we are active in that area and are also eager for new technologies. The Graph community calls are for ISVs and developers as we are to get the latest news and stuff. CU at the next Graph community call! Great news about "Microsoft Graph Community Calls" and I hope this must be a very good opportunity to learn and understand many interesting topics on Microsoft technologies. In addition, thanks much for sharing those links to follow the subscribe process. Thank you!